ODNR officials along with Washington Nile School District and Scioto County Commissioners we on hand Tuesday to accept a check as apart of the Trees to Textbook Program. 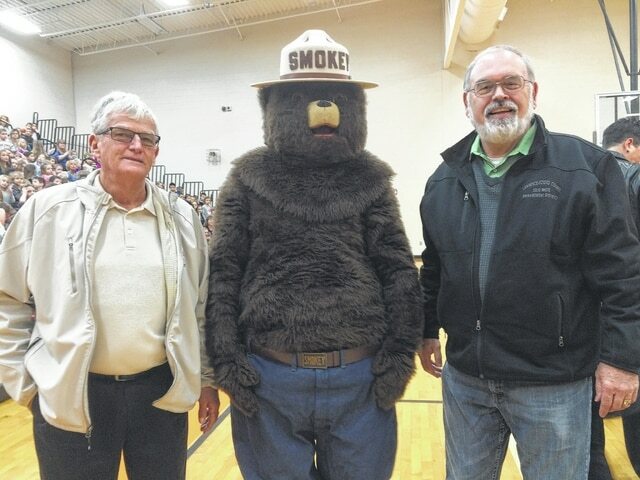 Scioto County Commissioners Doug Coleman and Mike Crabtree got to meet Smokey Bear at Portsmouth West Elementary School on Tuesday. On Tuesday officials with the Ohio Department of Natural Resources (ODNR) visited Portsmouth West Elementary and Northwest Elementary to present checks to the districts as a part of the Trees to Textbooks program. ODNR Director James Zehringer was on hand for the presentations and addressed school assemblies. The money presented to the districts and other agencies throughout Scioto County represents a portion of what’s taken in by the state from timber sales revenue from Shawnee State Forest and Brush Creek State Forest. In total, Scioto County, along with various townships and school districts will receive a collective $736,548.72. Among the net total the Scioto County Government will be receiving $184,137.18. Brush Creek Township will receive $8,537.50; Morgan Township will receive $13,647.73. Nile Township will receive $75,015.56, Rarden Township will receive $57,713.46, Union Township will receive $29,222.93, Northwest Local School District is set to receive $164,775.80 and Washington-Nile Local School District will receive $150,031.13 and the Scioto Valley Local School District $53,467.43. Smokey Bear was also in attendance and helped teach the students the importance of fire safety and to never play with matches. According to released information, ODNR Division of Forestry is responsible for the care of nearly 200,000 acres of state forests. State forestry experts manage these woodlands for overall health and diversity, soil and water conservation, improved wildlife habitat and a variety of recreational opportunities. Selected trees or areas of woodland are harvested through a competitive bid process that includes requirements for sound management practices. All work is conducted by certified master loggers under strict monitoring. For more information about ODNR Division of Forestry of the Trees to Textbooks programs visit, ohiodnr.gov/forestry.